We’d love your help. Let us know what’s wrong with this preview of Strictly No Elephants by Lisa Mantchev. Today is Pet Club day. There will be cats and dogs and fish, but strictly no elephants are allowed. The Pet Club doesn’t understand that pets come in all shapes and sizes, just like friends. 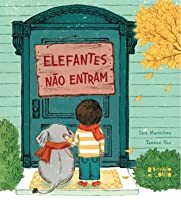 Now it is time When the local Pet Club won’t admit a boy’s tiny pet elephant, he finds a solution—one that involves all kinds of unusual animals in this sweet and adorable picture book. To ask other readers questions about Strictly No Elephants, please sign up. Friends, just like pets, come in all different varieties. A sweet story of friendship, acceptance, and inclusion. Our sweet little boy was recently diagnosed with autism - although we’ve been open-minded for the past 26 months that he could possibly hold atypical complications due to prenatal environmental stressors and neonatal abstinence syndrome, yesterday afternoon was the official diagnosis by our pediatric specialist. In “celebration” for our little ohana - my beautiful wife & I read this endearing children’s book to our pretty daughter and handsome son. Actually, a brilliant three year old big si Our sweet little boy was recently diagnosed with autism - although we’ve been open-minded for the past 26 months that he could possibly hold atypical complications due to prenatal environmental stressors and neonatal abstinence syndrome, yesterday afternoon was the official diagnosis by our pediatric specialist. Actually, a brilliant three year old big sister read this lovely book to her bright two year old little brother - with the help of their proud Mommy & optimistic Mama. The gentle flow of words with vibrant illustrations had our two adorable children smiling in delight with this wonderful story immediately - all in the powerful teaching of compassion, acceptance, empathy, kindness, self-confidence, friendship, courage, and inclusion. Life lessons we hope to continue to instill and share with our two heartbeats for decades to come - whilst serving our country, traveling the world, and immersing ourselves within vibrant cultures on this vast earth as a positively resilient Military/Adoptive/Autism family. Great story about inclusion and acceptance. Exceptional illustrations. I truly enjoyed it. I love this times infinity! "That's what friends do: lift each other over the cracks." "That's what friends do: brave the scary things for you." "Because that's what friends do: never leave anyone behind." 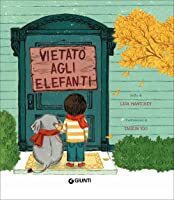 Banned from an existing pet club (because "Strictly no elephants"), an elephant and a boy meet new friends with a variety of animals as they walk home) decide to start a new club where [the sign reads] "ALL ARE WELCOME." The book closes: "My tiny elephant will give you directions [to the clubhouse] if you need them. Because that's what friends do." Glad to see "everyday diversity" here, a multicolored cast of kids. So sweet. Everyone needs this book and not just because he has a Tiny Elephant for a pet. Adorable. Used for an elephant-themed storytime on 11/7/17. It’s Pet Club Day! 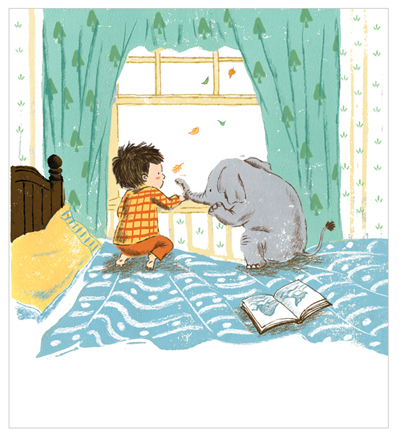 A little boy and his tiny pet elephant are looking forward to meeting all the other pets and friends. Once they arrive though, they find a sign declaring—Strictly No Elephants. 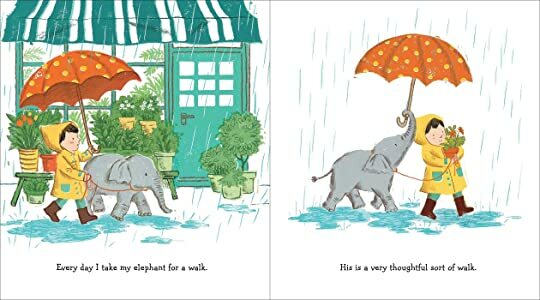 Both the tiny elephant and the boy are down, down, down in the dumps until they meet up with another unwelcome Pet Club pair. Maybe it’s time for a new club! A club where all are welcome! Simple, sweet, easy to read words with soft colors and cute characters create a warm, welcoming feel to the book. A book that reveals and shares the meaning of friendship. A perfect bedtime story in my book. Cybils finalist for best fiction picture book. Wow. So amazing. Beautiful illustrations and text. Perfect example of pure kindness, no exceptions. 1/20/2019 ~ Do you want a book to talk about friendship? Setting up classroom guidelines about how to act as a friend? Great illustrations, a diverse range of children (and pets), and a punchy story. A delightful book. I love the part where they crossed out the parts of their sign that left people out and just went all inclusive. I want a tiny elephant with a red scarf! A sweet story about the importance of inclusion and acceptance of differences. Lovely book. Gem of a picture book for the K-Grade 2 group. In this day and age of divisiveness, this book brings the message of friendship, inclusion, and acceptance...no matter the person or the pet. When an elephant and a skunk are excluded from a club, two kids are smart enough to start a new club. I loved it and would like to see it in every library. What a sweet book! This would be a great one to share with children for a storytime or discussion on friendship, acceptance of differences, and even pets. The adorable illustrations really share the emotion of the story. 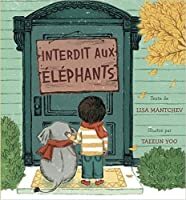 Beautiful story about welcoming and accepting everyone, even Elephants and Skunks, because that is what friends do. Wonderful illustrations. Really cute book with a great message about kindness, friendship, inclusion, and acceptance. I highly recommend this book to all parents, teachers, and caregivers. The illustrations are much better than the text. They really save it from being too preachy and overly sweet. It's a nice concept, though. Highly enjoyable. Who's to say you can't have a skunk, elephant, or narwhal as a pet? What a sweet story about friendship and inclusion! It's Pet Day, but when the narrator and his pet elephant arrive, there is a sign that says, "Strictly no elephants". When they meet another child with her unwelcome pet, they decide to begin their own club where everyone is welcome. Adorable! It was one of those cuteness overload (in the best way) books. I loved seeing the range of unique pets and the message that it’s okay to be a little different and interested in different things. I simply loved this one. So. Cute! I love the illustrations. Hands down on of my favorites! The message is simple, the story is endearing, and the artwork is great. This story is very sweet. My kids loved it! Never judge a kid by its friendly and weird animal companion. This is super adorable and it's a great book for a storytime!! This was an adorable read. I absolutely loved this book. Author did a great job. I read this for my son's reading time. super cute. oh my goodness. Lisa Mantchev is a temporally-displaced Capricorn who casts her spells from an ancient tree in the Pacific Northwest. When not scribbling, she is by turns an earth elemental, English professor, actress, artist, and domestic goddess. She shares her abode with her husband, two children, and three hairy miscreant dogs. She is best known as the author of the young adult fantasy trilogy, The Théâtre Il Lisa Mantchev is a temporally-displaced Capricorn who casts her spells from an ancient tree in the Pacific Northwest. When not scribbling, she is by turns an earth elemental, English professor, actress, artist, and domestic goddess. She shares her abode with her husband, two children, and three hairy miscreant dogs. She is best known as the author of the young adult fantasy trilogy, The Théâtre Illuminata. Published by Feiwel & Friends (Macmillan,) the series includes the Andre Norton and Mythopoeic awards-nominated EYES LIKE STARS (2009), PERCHANCE TO DREAM (2010), and SO SILVER BRIGHT (2011.) Her Kindle #1 Bestselling young adult steampunk novel, TICKER, is available from Skyscape. Her near-future young adult collaboration with Glenn Dallas, SUGAR SKULLS, is forthcoming from Skyscape. Her adult urban fantasy collaboration with A.L. Purol, LOST ANGELES, is now available on Kindle along with its sequel, LOOSE CANON. Her first picture book, STRICTLY NO ELEPHANTS, is now available from Paula Wiseman/S&S, to be followed by SISTER DAY! and JINX AND THE DOOM FIGHT CRIME.